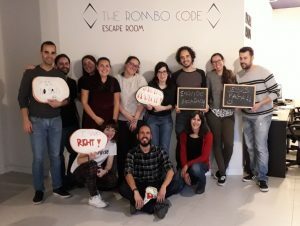 To say goodbye to our awesome research assistant Lola, we had fun getting out of an escape room. 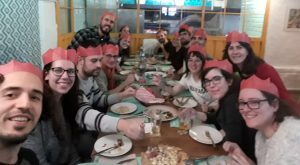 Group Christmas Lunch. Some UK traditions (via Gibraltar) were added to the mix this year. Much first time cracker pulling around the table! PhD students of our group and our collaborator teams during the 2nd Chemistry PhD Conference, outside the Chemistry Building of the University of Sevilla. Notice the lovely late October weather! 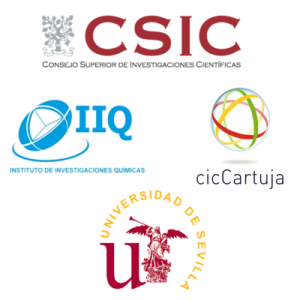 During the 1st Chemistry PhD Conference, University of Sevilla. 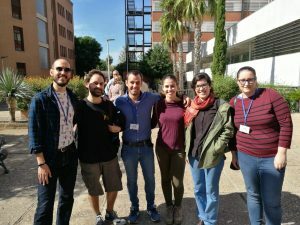 From right to left: Juanjo, Jesús, Marina, Mario, Juanín and Nere. And yes, the elegant young sir on the left is Prof. Riccardo Peloso, from our QUIMERA CSIC Research Group.